I don’t think we really understood, in the beginning, how Risk Blossoming would truly become a way of life for us. This “little idea” has blessed our lifes and encouraged us to continuously step out of our comfort zone, move forward, speak out, change and take steps to fulfill our dreams and desires. Together, Tim and I have committed to continually risk blossoming and to live the life that we have envisioned. Since embracing this mindset, it seems that each day is filled with opportunities to EXPLORE, DISCOVER and GROW. As we talk with old and new friends, we love to listen to their inspiring risk blossoming stories. Stories where they decided to take charge of their life, and do the things and go to the places that they have dreamed of. We’ve heard some wonderful and inspiring stories that have truly fueled our souls!! We have decided that these are stories that must be shared, and we can’t wait for you to be inspired by them too. 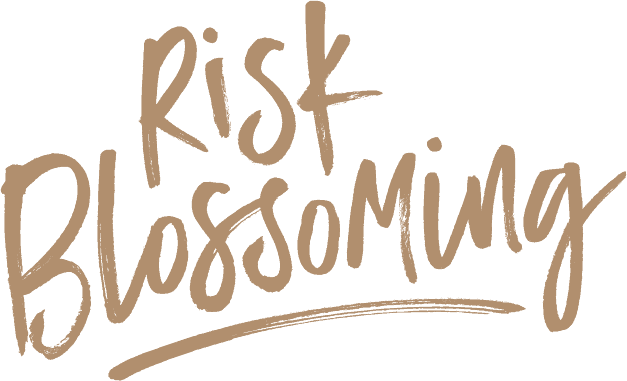 As we travel forward together we’ll be inviting occasional “guest blossomers” to share their risk blossoming story. Stories in which they have stepped out of their comfort zone and aligned their life with their dreams. 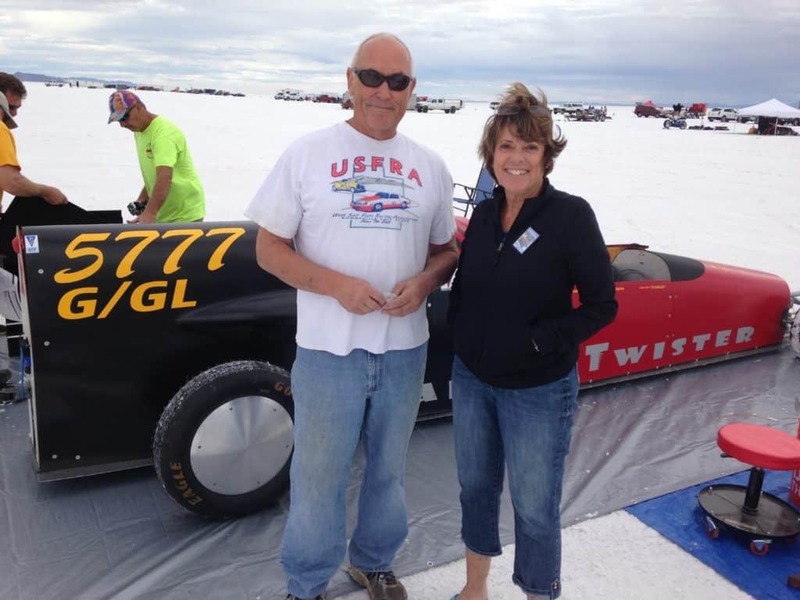 Our first Guest Blossoming article from is Lyn St. James, an American former racecar driver. 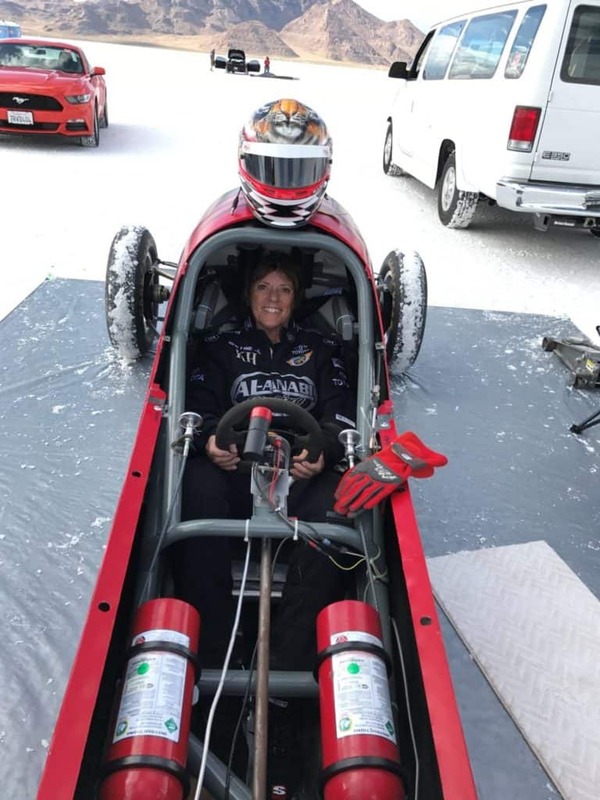 Lyn has competed in the IndyCar series, with eleven CART and five Indy Racing League starts to her name. 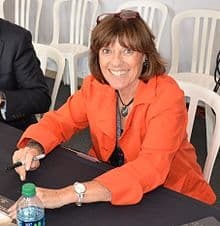 Lyn is one of only nine women who has qualified for the Indianapolis 500 and became the first woman to win the Indianapolis 500 Rookie of the Year award. She also has two victories at the 24 Hours of Daytona, and one win at the 12 Hours of Sebring. Additionally, she has competed in endurance racing in Europe, including the 24 Hours of Le Mans and the 24 Hours of Nürburgring; in the latter, her team placed first and second in class in 1979. In addition to being a famous race car driver, Lyn is an author and inspirational speaker. 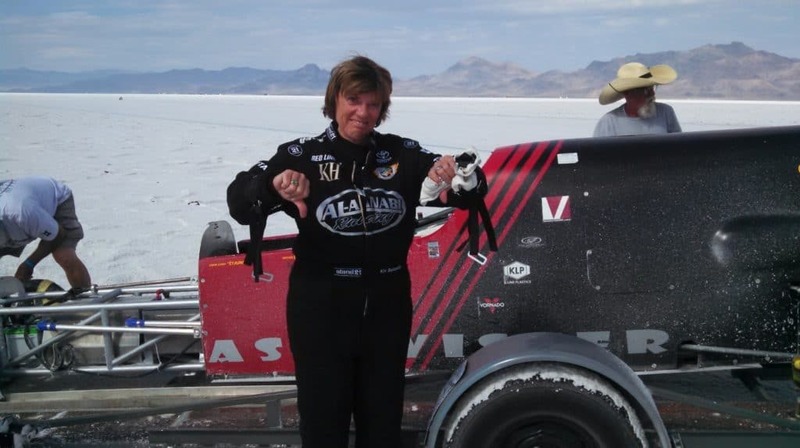 And, even with all the trophies, lifetime achievements, and accolades – this is a woman, at 70 years old, who decided to pursue her dream and vision of Salt Flat racing and joining the 200 Club. Please enjoy this wonderful Lyn St. James’ story, which took place September 14 thru 18, 2017, when she took the risk to continue to blossom. 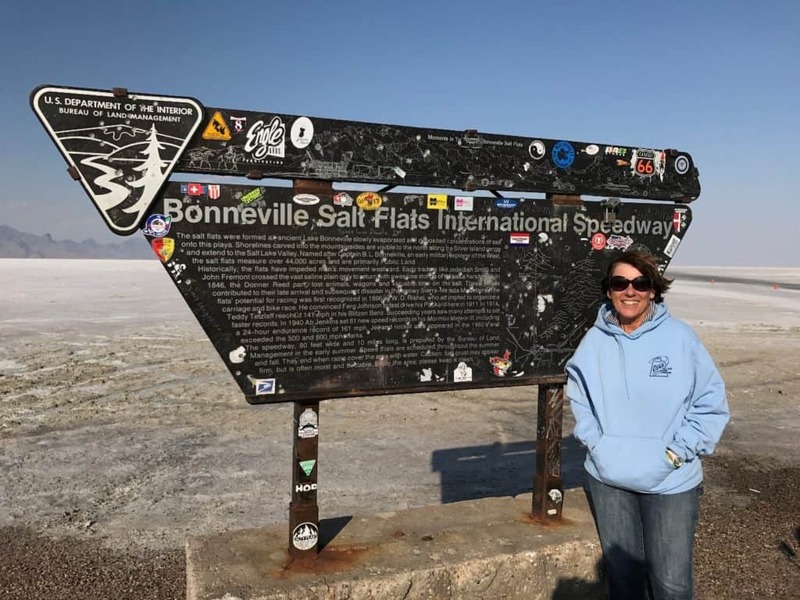 What is Bonneville Salt Flat Racing? Why is there such a mystique about it? And why does just about every racer want to go there? 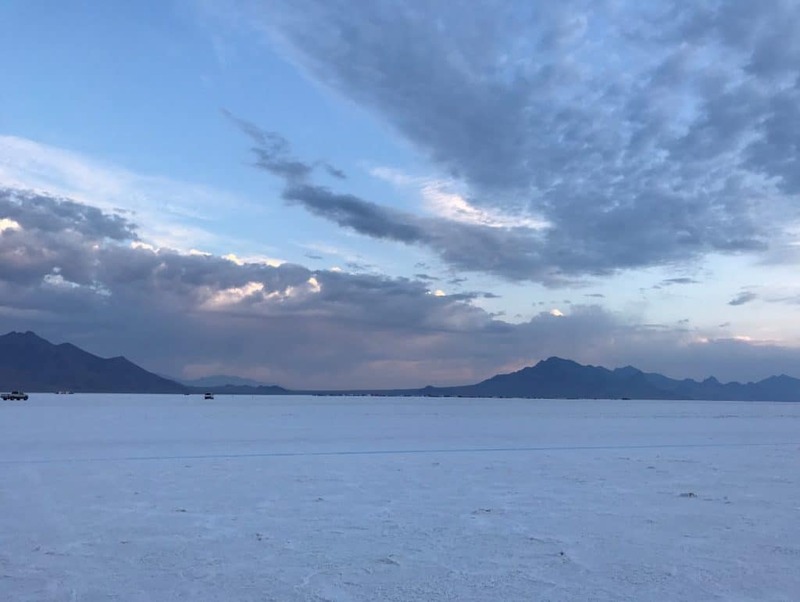 I was fortunate to finally get the opportunity to run on the salt at the Utah Salt Flats Racing Association (USFRA) 31st Annual World of Speed event.After wanting to run on the salt for many decades, it finally happened, and I’m starting to understand it. I think it’s the Ultimate Mechanical Challenge.It combines creativity, design, and the engineering ingenuity to “build something to a diverse set of rules that will go fast on an unknown surface”.The only area where there’s no compromise is in safety – because the tech inspectors take no prisoners when it comes to safety inspection.Everything is thoroughly checked (even the all the driver’s gear – including underwear – to the highest degree of FIA safety specs). There’s a huge diversity in the types of vehicles that show up to run on the salt: production cars, custom built race cars, modified street machines, motorcycles, trucks, 2 wheels/3 wheels/4 wheels, wings, no wings, hot rods, just about anything and everything the mechanical mind can imagine.And the unknown surface – well that means every time there’s a meet on the salt, no one knows what condition the salt surface will be in until the day(s) of the meet.It varies based on the weather over the last season, the current weather conditions, and the constant deterioration of the salt.It takes place on public land managed by the Bureau of Land Management (BLM), so authorization has to come from the BLM to schedule the race meets. 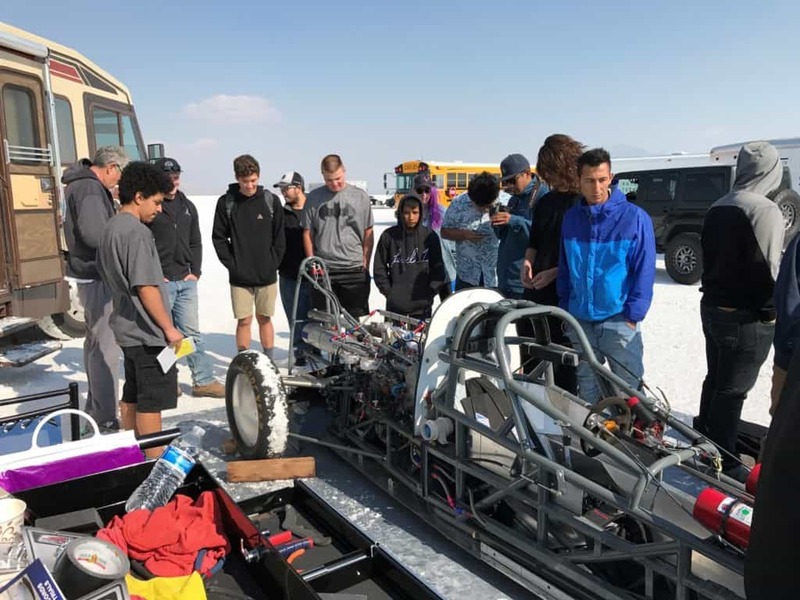 Many variables, many unknowns, yet people spend all year (years) to build/prepare a vehicle to run on the salt, and often the event will either get canceled prior to the scheduled dates/or even while on site. Literally and visually it’s a phenomenon. The area is a remnant of the Pleistocene Lake Bonneville and is the largest (46 sq. miles) of the many salt flats located west of the Great Salt Lake. Speed runs have taken place on the salt flats since 1914. But I think there’s a mystique when one looks out over this massive white surface, surrounded by mountains, and often you see a mirage that looks like the surface is actually water.And depending on the clouds and sun, everything set against this white surface takes on such artistic forms.Jaw dropping. The combination of history, engineering ingenuity, limited access (at best 3-4 times/year), the wide range of types of vehicles, and of course – the SPEED!NOTE:It’s difficult to describe the salt; it’s very coarse, in some places really hard; in other places quite mushy (like slush); quite crusty, and in there are ruts and potholes.It’s never really smooth.And it sticks to everything!! How did I get to the Salt Flats? I’ve wanted to run on the salt since the 80’s and over time quite a few people knew about it.At Amelia Island in March of this year, Bill Warner had a special display of land speed record cars, and while I was drooling/taking photos of the cars I ran into Ted Wenz of Savannah Race Engineering, who knew about my desire to run on the salt.He asked me if I was still interested in doing it, and of course, I said “YES”.He connected me with John Goodman out of Wichita, KS who was building a Lakester to take to Bonneville, hopefully, later in the year.John and I started emailing back and forth, and the wheels were now in motion.I joined the USFRA and got the rulebook so I could learn what a Lakester was, and what I needed to get/do as a driver. NOTE: A Lakester is a streamliner with four exposed wheels, and there are many different classes based on the engine size.John’s has a 2.0 Cosworth BDG engine, so the category is G/GL for engine size, Gas Fueled Lakester. 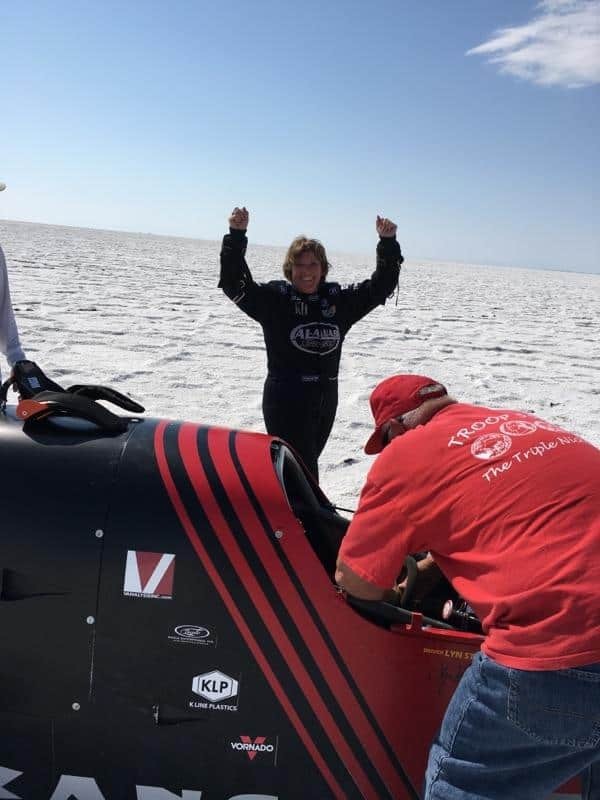 The current record in that class if 211.463 mph. I had to upgrade my Nomex, which was fine, except for the race suit (because they are so expensive and this would likely be a one-time use, I was hoping to figure out how I could borrow a suit). I ran into Yves Morizot, founder of Stand 21, at the Rolex Reunion at Mazda Raceway, and Stand 21 came to the rescue. They had one suit (FIA 20 grade) that just might fit me.Walla! So I was ready (at least for the things I needed to do). THANK YOU, STAND 21! I decided to rent a car and drive from Phoenix, which would give me flexibility in my traveling day(s).I left Phoenix on Tuesday, 9/12 expecting to arrive in Wendover, UT that night.I almost made it, but had a tire blow out on my rental car just past Ely, NV – so I ended up spending the night in Ely, NV and had to wait for a replacement rental car the next day (crazy car had no spare tire/just one of those stupid pumps). As I drove into Wendover the marvel of the salt flats appeared off to my right and I just had to stop and take a photo.I arrived Wednesday afternoon and immediately went to the Bonneville Salt Flats.Everyone was just starting to set up; the folks at registration recognized me and gave me my car and pit pass, but I couldn’t officially register until the car arrived and passed tech.After I checked into the hotel I got a call from John saying they had arrived. (They had 3 flat tires on the drive from Kansas). It rained during the night, at least at the hotel, which was only about 10 miles from the Salt Flats. We agreed to meet at the course at 9am, so I met John for the first time, along with his crew: “Izzy”, Glen, “Bones”, Wayne and a little later “Stainless”.The sky is dark, ominous, and looks threatening for the entire day, but the only place it rains is in Wendover, but not on the course.The first order of business is to take the car through tech.This is a newly built car, so tech inspection seems to be more critical than usual. Did you see the movie, “The World’s Fastest Indian”?Well, that’s what it was like going through tech.John Goodman is an experienced record holder on the salt flats, but hasn’t been there since 1999, so he’s a bit nervous.And then there’s me, a salt flat rookie, but somewhat “known entity”, so there’s quite a bit of attention being paid by everyone. Almost 2 hours later and after much discussion, we leave the tech area with a list of things that need to be changed, or the car cannot run! Stainless has arrived on the scene (a true legend/veteran salt flat record holder) and the consensus is they’ll be able to fix things, so let’s work on fitting me and John in the car so we can do our “Bail Out” tests (this consists of after being tightly strapped into the car, the driver has to release everything and be able to get out of the car unassisted in less than 30 seconds).Love the optimism in all racers!! While I make a lunch run to town (drenched in rain) they fit John in the car and he passes his “Bail Out”.Then they start fitting me in the car (not an easy task). Most critical is being able to see and reach everything in the cockpit.About 3 hours later the tech inspectors show up to observe by “Bail Out”.I have to be able to exit the car on my own from a tightly strapped in position in under 30 seconds.The canopy weighs about 20# and isn’t hinged, and the latches are hard to reach.But I get it done (in 21 seconds).As I look up at the sky, there’s a rainbow! We leave the track and decide to meet for dinner at the Copper Kettle Diner (not many options in Wendover – other than the casinos in West Wendover, NV).Good day! The driver’s meeting is scheduled for 8 am, with another rookie driver’s meeting at 9am.Everyone is able to take their personal/tow vehicles down both the long course (7 miles) and short course (5 miles) to observe where the mile markers are, lines marking the course, and other important landmarks.It’s incredibly windy and hazy, so it’s pretty difficult to see much of anything.I’m in information overload at this point.“Floating Mountain” and other references are discussed.I’m used to finding braking zones, turn in points, and apexes, but they’re like right in front of me.Now I’m having to look at quarter mileposts, mile markers, and having a difficult time seeing them at 20 mph!Relax!Patience is required.The wind never lets up; wind gusts over 20 mph, so the track continues to be on “hold” because of the wind.But our crew is now more focused on fixing the things that need to be changed from tech inspection.This mostly has to do with how the fuel lines are run – and not isolating the driver compartment from potential flow if the fuel line were to leak/break.A solution is discussed, and before work is started they discuss the solution with the tech inspectors, who seem to agree.Work begins.About 4 pm in the afternoon, work is completed and tech inspectors come back for final sign off!YES!We can now officially register and be ready to run tomorrow. Let’s start the motor and do a systems check.Grind/grind/grind.The car won’t start.At this point, I determine there’s absolutely nothing I can offer, and I’m completely windblown from the elements, so I decide to go back to the hotel.NOTE:One high point of the day was the arrival of 14 school buses full of high school students from area schools.How cool to see so many kids excited to be around these vehicles, asking questions, and taking photos.They stay for a couple of hours.I find out later that some of the buses got a chance to drive down the course since it was closed due to the winds.What a great experience for the kids! Perfect conditions!Cool (low 50’s), sunny, no wind.I arrive at the track about 8am, and the crew are making last minute adjustments to the car to get it ready to move over to the short course. About 8:30 one of the fastest streamliners, the record holder Vesco Terminator II, makes a pass and everyone stops for a few minutes to listen (they announce the speeds on AM radio 1610 & CB radio) to what the speeds are: 315.664mph at the quarter mile, 338 mph at the 1 mile, 395 at the 2 mile, 420.499 at the 3 mile, and final trap speed is 430.524.Not a record run, but really fast!About 10am they get the car loaded onto the trailer to get in line on the short course, and load the van with as much support equipment they think they will need.It’s like the paddock is transported to the line (which is now the pits).And the line is long; 38 cars ahead of us. This reminds me of my early drag racing days; hurry up and wait in line to make a pass that will only last a few seconds/minutes.There are 3 lines on the short course: one for the 130mph club cars, one for the 150mph club cars, and one for Land Speed Record cars (which is the one we are in – the longest line! ).There is very little activity, time to wander around, but not much to see.Things get really quiet and we realize the course is shut down; there’s a communication glitch with the officials (which threatens safety) so the delay is over one hour.When we’re about third in line John gets suited up and warms up the engine.At about 3:45 (5 hours after we put the car in line) the starter waves John to “go”. I’m in the van, which is the push vehicle, so we push John at the starting line and off he goes.Since this is his first pass, he’s not to exceed 150mph, and even though he only has to go to the 3 mile marker, he seems to disappear into the horizon.It’s a successful run (clocked 138 mph between the 2-3 mile markers), but he’s not happy.The car is unstable, but he needs to get back in line for his second run (between 150-175mph).They inspect the car and begin making suspension adjustments while it’s in line. There continue to be delays, some vehicles take runs, and darkness begins to threaten.Even though it was scheduled to stop at 5 pm, they run until a little after 6 pm when one of the cars seems to go off course immediately after leaving the start line.End of the day! We keep the car in line so it will be able to go out early tomorrow morning, and after that, it will be ready for me to run the salt!But we’re done for today! I’ve been here for four days, but still don’t know what it’s like to drive fast on the salt! I arrive at the track at 7 am – there’s cloud coverage on the horizon, but you can see the sun peeking out as it comes up.I get a few good photos of the sunrise over the salt.The weather is perfect – cool, and soon to be partly sunny. John goes out about 9:15 am and gets a good run – 174mph. While walking around the pits I look over and see someone I recognize, but didn’t expect to see here – Ray Evernham.He tells me he’s doing a documentary on the Bonneville Salt Flats.He said Erin told him I was going to be here.He said let’s do an interview.I get suited up and we do an interview. Now that John has his first two licensing runs done it’s time to get the car ready for me to run. This involves installing the seat insert, pads, and additional seat belts (cheek belts).At about 12:15 I get my first run down the salt! The timesheet they hand out has the following breakdowns on the short course: NOTE: These are all averages. Here are all my runs. You’ve heard the saying “flying blind”, well my first runs down the salt were literally driving blind.I’ve never done anything in racing quite like this – no real seat of the pants feel, and can’t see much at all.Between the vibrations, distortion in the canopy, the bright white salt, the wide space between two blue lines marking the edges of the track (done with environmentally safe type fluid), and looking for the mile markers at both edges of the track, you really have no idea where you’re going!I also can’t read the GPS gauge on the steering column that indicates speed.And that’s the ONLY indicator to give you any idea of how fast you’re going (no tach/no temperature gauges/no gear indicator), so I just shift by the sound of the engine.They give me “speed goals” for each gear, but since I can’t read the speed, it really doesn’t matter.I know the goal is to stay between 125-150mph to get my “D” license.Luckily I achieve that with the 142.40744 mph.When they check over the car they realize the battery is down, so they put a battery charger on it and work on the GPS speed gauge. I abort my next run after the 1 mile because the inertia switch tripped and shut the car off (we didn’t realize what it was until John got to the car and saw it had tripped).At 3:30 I get back in and do a second run, but I can’t shift into 4th gear, so I top out in 3rd gear at about 157 mph, which at least earns me my “C” license (150-174 mph).We get back in line and at 5:40 I get in my third run, but still couldn’t get it into 4th gear.I’m getting really frustrated.Long lines, so much work/time spent taking any part of the body off the car to work on it, it’s like time stands still.And then when I DO finally get on the course, something (or maybe me) isn’t working. We call it a day and decide to go to the Salt River Café Mexican restaurant for dinner.Good call!Time to gather the troops – but my throat is sore and I feel a bad cold coming.The weather is predicted to be windy tomorrow (Monday), which means the course may not even be open. I mention to John that if the track is open it might be good for him to run the car and check out what’s happening with 4th gear.It was left we’ll just see what the weather will be.And they’ll check the car out in the morning.I go back to my hotel feeling under the weather (literally) and thinking that the likelihood of me getting any more time on the salt isn’t likely to happen. I get a good nights rest and slept in a little bit since I figured I wouldn’t be running.My cold wasn’t any worse, so I figured I’d get some cold medicine, stop at the course to see everyone, go to impound to get my license and get ready for the drive back to Phoenix. As I’m checking out of the hotel my phone rings and it’s Gary (from the team) who says “get suited up – they found the problem with the shift linkage and we’re getting ready to run with you in it”, so I hustle over to the course.And the conditions are perfect – no wind, cool (60’s), partly cloudy.I arrive about 9:30 and the crew are working on the car (they found where the shift linkage was hanging up), and we load the car on the trailer and transport it to the pits.There are only a few cars around, which is great – NO LINES! There’s excitement in the air, and I hear John say “I have a good feeling about this”.YES! I’m going down the course and the car shuts off 2 times, so I pushed the inertia button down twice and kept running (got into 4th easily) and when it happens the 3rd time, I know we aren’t going any faster so I abort the run and go down the turnout area.Bummer!John and Stainless decide how to fix it so it won’t happen again, and we take it back to the start line. I notice on my last run how much more my situational awareness had improved.Even though I couldn’t see any better, it just seemed easier to see what I needed to see.And things now felt like they were happening almost in slow motion rather than fast forward motion.As I looked down the course I felt the left side of the course looked a bit smoother (plus that line was used for the slower cars the last few days and probably had gotten beaten up less), so I talk with Stainless and tell him I’m going to try to stay closer to the left side of the course. I learned later I was right because the workers had “dragged the left side of the course up to the 2-mile marker” that morning (that’s how they smooth out the course – they drag wooden pallets behind trucks to pack down and smooth out the ruts in the salt). My confidence level had also improved, so as they pushed me from the start line and I dropped the clutch at 30 mph in 1st gear, I was “ON IT” full throttle – and went through the gears aggressively – yes, I’m “going for it”.All my shifts were by sound (still can’t read that damned GPS gauge, and when I do see a number, I don’t like it – it’s too slow).Sailed into 4th gear – throttle down, just past the 2-mile marker, when the front of the car takes flight and turns toward the right! I go into a couple of spins – pull the parachute lever (which because I was going backward/ didn’t deploy) and land/dig deep into the salt headed up course.I “Bailed Out” (fortunately had practiced that earlier in the week) and by the time the course workers were there I was out of the car.I was fine – and amazingly the car wasn’t too bad. Fortunately, it stayed upright, the nose box was somewhere down course, and the undertray was all torn up, but the cockpit and engine bay/rear bodywork, were all attached and other than being covered in white salt, were all good.This was not how it was supposed to go.I knew I didn’t do anything wrong; in fact, I felt pretty good about how I handled it.Then one of the course workers comes up and tells us my speeds: 177mph at the Quarter (2-1/4) marker (which would earn me my “B” license) and between the 2-3 mile marker (which I was traveling airborne) the speed recorded was 273.63078mph.How could that be?!? The only thing we could determine was – I tripped the timing line. It’s hard to put into words how blessed and grateful I am for the opportunities I’ve had in racing.Running on the salt has been a goal for decades, and to finally get the chance to do it was amazing.I’ve been asked “is it what you expected”, and my reply is “I had no idea what to expect, and kept an open mind”.I’m glad I did.In my opinion, it is the ultimate challenge and test of courage, commitment, and determination.The patience required, the problem solving, the ability to brave the elements, and the determination to keep coming back (whether it’s to go for another run, or get ready for another year), is beyond anything else I’ve done in racing.I’ve raced SCCA (amateur and pro), IMSA, Indycar, off-road, go karts, FIA, vintage, but nothing compares to running on the salt.Yes, there are rules, but there are so many ways to “do it” which can be successful or get you in trouble.To some degree, I think it’s a throwback to what racing used to be like (race what you bring to the track), but don’t be fooled, it’s not crazy nor easy. I want to thank Ted Wenz for introducing me to John Goodman, and thank John and the entire Kansas Twisters for giving me this opportunity and giving it everything they had to give. 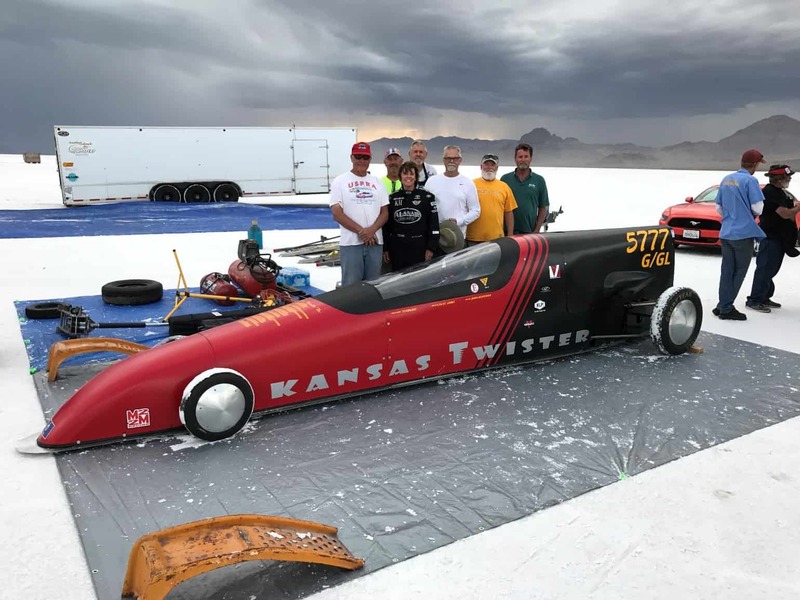 And thank you to the Utah Salt Flats Racing Association (USFTRA) for continuing the legacy and passion of salt flat racing – Safe is FAST!! I want to earn my 200 mph Club Membership!